"The Father of Mt. 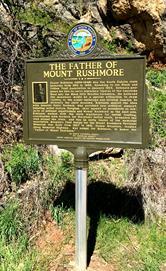 Rushmore"
Father of Mt. Rushmore Mt. 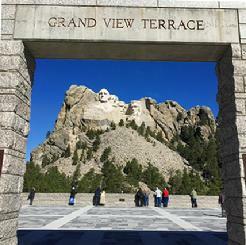 Rushmore, South Dakota, where the visages of four presidents, Washington, Jefferson, T. Roosevelt, and Lincoln are massively carved into the mountain, means different things to different people. For some, it is awe at the enormity of the vision begun by the �Father of Mt. Rushmore�, Doane Robinson. For others, it is the recognition of the skill, the drive, the single minded belief in the project of, at times controversial, sculptor Gutzon Borglum. But for most Americans, it is a visible, tangible link of our great country that we all can reach out and touch together. Doane Robinson (1856-1946) was the South Dakota state historian from 1901 to 1926. Speaking to the Black and Yellow Trail Association in January 1924, Robinson proposed his idea to carve legendary figures of the American West into the Black Hills Needles formation. He believed the monument would be a special attraction to draw visitors to the scenic landscape and develop tourism to diversify the state economy. Robinson shared the idea with Senator Peter Norbeck who provided key political support. Enlisting artist Gutzon Borglum, they agreed on presidents as subjects of national significance and Mount Rushmore as the best site. Robinson worked with the state legislature for initial funding, coordinated with Norbeck for Borglum’s initial visits, promoted the idea around the state, and was an early leader of the memorial association. Borglum’s final design for the Mount Rushmore National Memorial was built from 1927 to 1941.